Spending on cloud infrastructure services continues to increase at a healthy pace with investment during the third quarter up 45 per cent on the previous year. While slightly lower than the growth rate achieved during the first two quarters of 2018, according to findings from Synergy Research, this “compared favourably” with growth rates achieved throughout 2017. 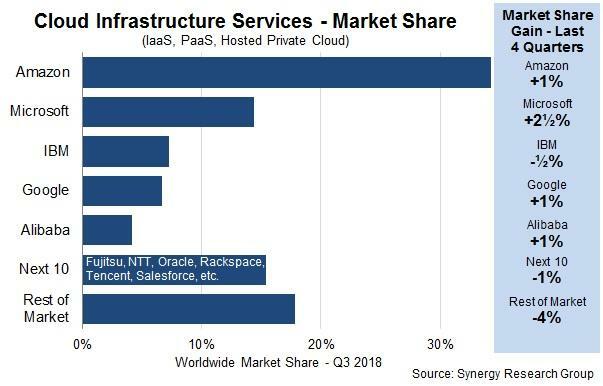 “This is another really strong set of numbers both for the leading cloud providers and for the market as a whole,” said John Dinsdale, chief analyst at Synergy Research. Meanwhile, market leader Amazon Web Services maintained its dominance and remains bigger than its next four competitors combined. “Its sheer scale prevents it from growing as fast as the chasing pack, but it still managed to nudge up its market share a percentage point to a little over 34 per cent,” Dinsdale added. Collectively, Dinsdale said the market share gains of the leading four providers “came at the expense” of small-to-medium sized cloud operators. “While many of those smaller providers are seeing reasonable revenue growth, they are lacking the scale and financial muscle of the leaders and are unable to keep pace with their larger competitors,” Dinsdale explained. With most of the major cloud providers having now released earnings data for the third quarter, Dinsdale estimated that quarterly cloud infrastructure service revenues have now surpassed US$17 billion. Specifically, this includes infrastructure-as-a-service (IaaS), platform-as-a-service (PaaS) and hosted private cloud services. The third quarter growth rate of 45 per cent compares with a full-year 2017 growth rate of 44 per cent and a 2016 growth rate of 50 per cent. 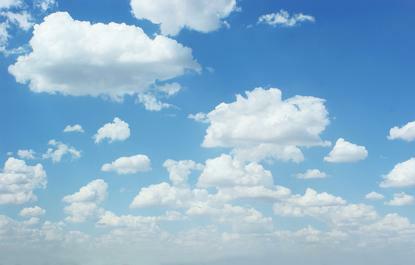 Geographically, the cloud market continues to grow strongly in all regions of the world, Dinsdale added. “The growth rates are tailing off at some of the leading cloud providers but that is just the law of large numbers kicking in,” he added. “You cannot keep on growing at 100 per cent when you reach massive scale. Interestingly, the role model for sustainable growth is market leader Amazon. “Over the last ten quarters the AWS year-on-year growth rate in these markets has been pretty steady and has averaged just a little under 50 per cent.